What is InfoPro? 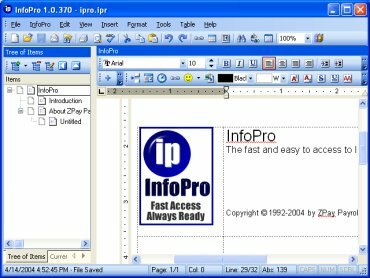 InfoPro is an application to manage your bits and pieces of information without having to manage multiple files. It can handle anything from a to-do list to complex notes. You can collect all your bits and pieces of information into a "hierarchical collection of notes" inside a "list of lists". InfoPro is designed to store information in a free-form way that does not limit your imagination. InfoPro is designed with easy-to-use functionality. We have tried to make the help file as complete as we can. This will help you get started. We hope the help file will answer many of your questions, guide using InfoPro and for your future reference needs. If you have never used our software before, you should become comfortable by following instructions in the Startup Tutor located on our website or on your CD. As always, the folks at ZPAY try to make using the computer simple, easy, as well as fast, and efficient as possible. We know as a user you don't need or require to know complicated procedures. What can I use InfoPro for? Some useful ideas how you can use InfoPro: Use it as a to-do list. Use it to collect notes. Use it to manage bits and pieces of information. Store notes that cannot be easily collected or organized. Use it as a shopping list. Use it as a free-form information organizer. What are the benefits of using this product? The Word processor included in this program has full Word 95/97/2000/XP Word XP* Compatibility. You can share data with Word 2000/XP without any loss of information. Ability to embed an Excel document into the program. Keep yourself organized. Why not use a database or word-processor? You could use a database, but it needs word-processing capabilities. You could use a word-processor, but it needs some organizational sort of ability without having to deal with filename and directories. This program combines a database with a word processor. infopro, information, manage, store, wordprocessor, business, reminder, todo, notes InfoPro manages bits and pieces of info without having to manage multiple files.